A summery scarf you have to crochet. 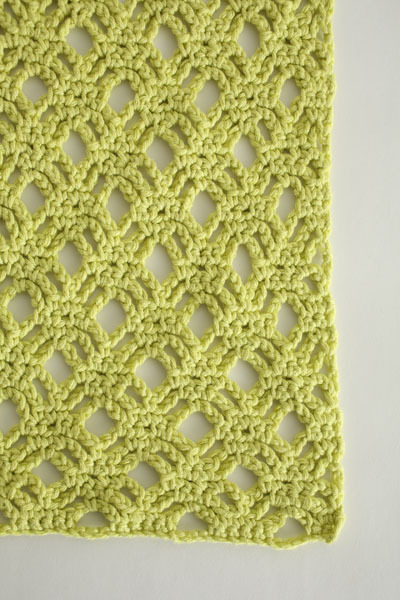 Crocheted lace is worked in a diamond pattern to create a beautiful, airy look and feel. This design begs to be crocheted in bright summery colors; choose a cotton blend to keep the project light. Once you start crocheting this “spider” lace pattern, you’ll be addicted and your scarf will be done before you know it. April Garwood is a prolific crochet designer whose patterns are well known for their fun and funky style. Just like all of April’s designs, the Lime Breeze Scarf combines form and function in an effortlessly chic wrap. 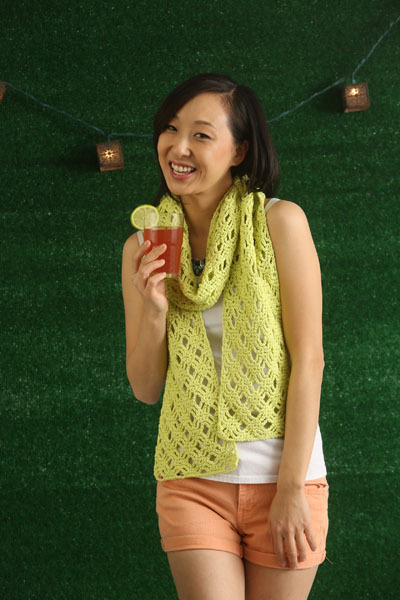 The Lime Breeze Scarf is perfect with shorts and a tee or with an open button-down in the evening. It’s simple enough for everyday wear but has enough texture to stand out against a cute sundress; summer style at its best! Lime Breeze flutters beautifully, adding that special wind-blown, sun-kissed look to any outfit. Whether you’re at the beach or sitting around your back-yard fire pit, you’ll wear this scarf all season long. One of my most regretted purchases. Have been subscribed for months no new issues yet. I can find more free pattern on most crochet or yarn websites. I also did not receive the free gift DVDs advertised for subscribing. I also am having my email bombarded with requests to subscribe to the magazine I already subscribed to.